When March rolls around, Jews all over the world and in the Middle East will celebrate the festival of Purim. It was a holiday that I looked forward to ever since I tasted my very first hamantaschen cookie. Though this delicious cookie is not exclusive to Purim, I still get excited when it is upon us as I start scouting the local bakeries for signs of the first batch of my favorite pastry. And yes, my obsession grew so fanatical that, a few years ago, I finally had to learn to make them myself. Home bakers make tons of flavor variations including chocolate, peanut butter, marzipan, and any number of fruit fillings. Traditionally though, most bakeries produce them in three flavors - poppy seed (my personal favorite), apricot (what I'll settle for if no poppy seed version is available), and prune (not something I considered edible as a child). As an adult, my preferences have pretty much stayed the same, but I've added my own new favorite filling of honey and dates. 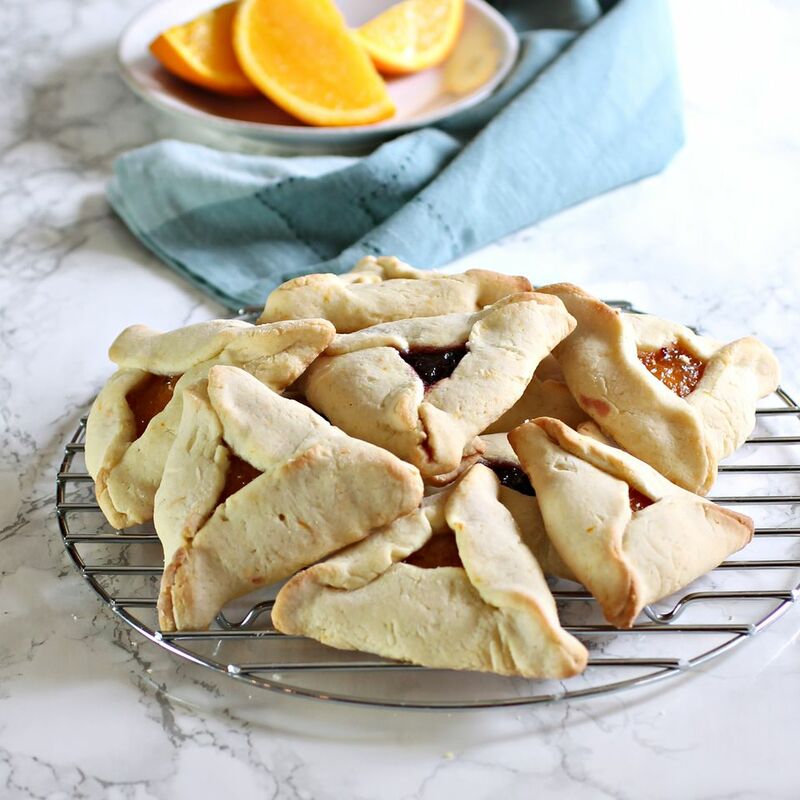 The recipe is basically a buttery cookie (although there are non dairy oil versions as well) but the distinct flavor comes from the orange juice and zest. I like mine large, crumbly and in plentiful supply! Add the egg and butter to a large bowl and cream together using a hand or stand mixer. Beat in the sugar, orange zest, and orange juice. Fold the dry ingredients into the wet, turn out onto a floured surface to form a dough ball, wrap in plastic and refrigerate for at least 1 hour. While the dough is chilling, make the filling by adding the dates to a bowl with the hot water and let soak for 30 minutes. Add the soaked dates and about 1/4 cup of the water to a food processor with the honey and salt. Puree until completely smooth. Roll the dough out to between 1/8- to 1/4-inch thick (I like thicker cookies). Use a 3 1/2-inch round cutter to cut circles out of the dough. Place about a teaspoon of honey date filling in the center of each dough round and fold into the classic triangular shape (see an easy tutorial here). Place on a baking sheet lined with parchment paper and bake for 12 to 15 minutes.